Hiking, Mountain and Road Biking, Nature, Cross Country Skiing, In-Line Skating, The Atlas covers trails in every corner of the state from Monroe County near Lake Erie to Keweenaw County in the Upper Peninsula and hundreds of places in between. Stay On The Lake - Traverse City - Our new lakefront lodging guide to help you find the perfect spot on the beaches of Grand Traverse Bay, Lake Michigan or surrounding inland lakes. Visit UPMichigan.com for travel information related to the Upper Peninsula. You'll find some great vacation lodging. Our New Wineries Guide Is Here! One of Michigan's most unique winery. 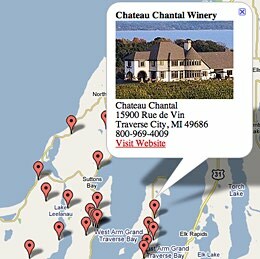 Chateau Chantal is located on one of the highest points on the Old Mission Peninsula, 11 miles north of Traverse City and 6 miles south of the old lighthouse at the tip of the peninsula. In the heart of scenic Algoma Country, Canada, Windy Lake Lodge treats you to a unique wilderness experience. And you get to take the Algoma Central train there and back. A true Northern vacation. of the Chain of Lakes!